This article is a short summary of Metroid Prime: Trilogy. Metroid Wiki features a more in-depth article. Metroid Prime: Trilogy is a Wii compilation of the three entries in the Metroid Prime subset of Metroid games: Metroid Prime, Metroid Prime 2: Echoes, and Metroid Prime 3: Corruption. For the original two games, the trilogy uses the New Play Control! ports previously released in Japan, rather than using the original Nintendo GameCube versions. 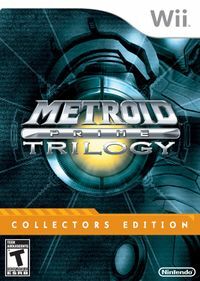 First print copies of the game were released as Metroid Prime: Trilogy: Collector's Edition, which came in a metal case with a slipcover and also contained an additional art book. The ultimate Metroid Prime experience! Play the trilogy as it was meant to be played as you enjoy all three epic Metroid Prime adventures on a single deluxe package. Explore Tallon IV and Aether like never before with the same precision and motion and pointer controls as Metroid Prime 3: Corruption. In Metroid Prime, explore the world of Tallon IV and witness the deadly experiments performed by the remaining Space Pirates. In Metroid Prime 2, investigate the hostile activities between twin planets Aether and Dark Aether, and learn of their shared energy source that is vital to their survival. The three games included in Metroid Prime: Trilogy play similarly to how they do normally; the controls for the original two games, however, are different due to using the altered New Play Control! versions of the games, incorporating motion-based features from Metroid Prime 3 such as the Spring Ball and Free Aim. In addition to the games, a number of extra features are included, such as a music gallery, concept art gallery, and various other extras (such as the Fusion Suit in the original Metroid Prime). These can be unlocked by spending credits, which have been incorporated into the previous two games like with Metroid Prime 3. The multiplayer features of Metroid Prime 2 have also been retained for this release. A "Friend Credits" system has also been included, that allows players to send credits to players on their Friend Lists with a copy of the game. AUS: January 30, 2015 A direct port of the game released as a digital download on the Wii U Nintendo eShop. Online features cannot be used for this release. For its first week of release, Metroid Prime: Trilogy could be purchased at half price. This page was last edited on 3 August 2017, at 02:12.